Cornell is a leader in the emerging field of Discipline-Based Education Research that explores teaching and learning from the perspective of a particular discipline, such as biology. This interdisciplinary field draws on knowledge and methodologies from social science, psychology, education, and cognitive science research, with the goal of enhancing student learning and instructor teaching. In EEB, current research focuses on developing assessment tools that explore student thinking in biology, enhancing diversity in the classroom through instructional changes to include more active learning, evaluating the long-term impact of different kinds of teaching on student retention and professional development in STEM, and creating faculty communities to explore issues such as helping students transition from high school to college STEM courses. These research areas are explored using classroom-based assessments, interviews, observation protocols, and surveys analyzed through quantitative and qualitative methods. Cornell has a growing and enthusiastic community of scholars who are engaged in Discipline-Based Education Research. Our research programs engage undergraduate and graduate students, postdocs, K-12 teachers, and university faculty. We collaborate with Discipline-Based Education Research scholars in Physics, the Active Learning Initiative community, and the Center for Teaching Innovation. 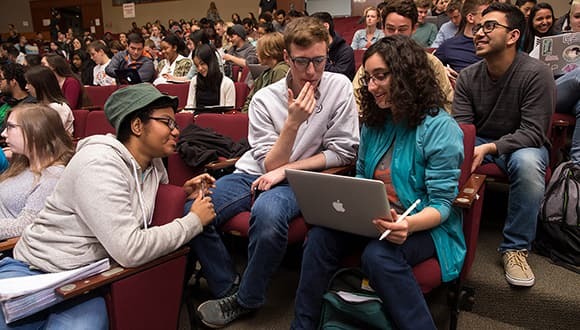 Members of our group participate in weekly journal clubs and research group meetings, and often sponsor events to engage the larger Cornell teaching community. We also collaborate with Discipline-Based Education Researchers at several other institutions, strengthening the questions we can ask and the generalizability of the results.